Difference between revisions of "Dark Paladins of Scholae Palatinae"
This article is about the rare title used in Scholae Palatinae. You may be looking for other uses of Dark Paladin.
" And so, The Paladins of Palpatine came into being. Few had fought gallantly. Even fewer survived. For most, the war had ended. For the fearless heroes of the Sun, Sword, and Dragon, the real conflict had only just begun..."
The title of Dark Paladin is awarded to the most prominent member of Scholae Palatinae outside of a Summit role at the discretion of the Quaestor. This honorary title is part of Scholae Palatinae’s way of giving a more recognizable thanks to an outstanding member beyond just a medal award. Dark Paladins hold the title for life, and are inducted into the Order of the Scholae Empire. The Paladins fall under the direct command of the Emperor. Created in the third year of Cotelin, at the dawn of the Seventh Great Jedi War, their purpose was to uphold Scholae Palatinae’s ethos and stand as a shining example of what an active member should strive to represent. 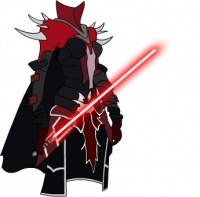 As the crushing fist of Palpatine, the Dark Paladin personified the terrors of the Sith Lord. They were the first on the line of battle, a banner for Scholae Palatinae, leading the soldiers onward. In times of peace, they worked ceasely to further the good of the unit. Through them, the Summit would encourage additional activity and discipline, as the Paladins were highlighted as role models. Only the best were allowed to be displayed as a Paladin. 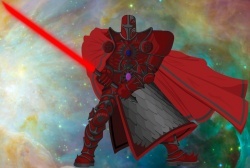 Recipients of the Dark Paladin award are automatically inducted into The Order of the Scholae Empire, an order of chivalry for those whose contributions to the empire go above and beyond rank and file duty. Membership of the Order of the Scholae Empire carries very little real power beyond what the Dark Paladin award does already, but does come with post nominal letters, suitable only for within-system communications, to mark the individual's status within the clan. While the award is typically only awarded to the Dark Jedi of Scholae Palatinae, the Order of the Scholae Empire is visible to the civilian populace, publicly marking those who have made significant contribution to the Empire. Upon first receipt of the Dark Paladin award, the individual is named a Member of the Order of the Scholae Empire, and are entitled to use the letters 'MSE' after their name for within-Cocytus communications, e.g. Evant Taelyan MSE. A paladin who continues to contribute at the same level to the clan will be elevated to the next level within the order upon receiving the award again. Upon receipt of the highest title, one may find 'Lord' frequently attached to the start of their name by the common folk, but typically not by other members of the Dark Brotherhood or military officers. A newly appointed Paladin is given an elevated status within the House. They are allowed to help moderate issues within the House, monitor IRC and Message Boards, and help train members as they see fit. Because only the most capable and trusted are awarded this, they are allowed new freedoms within the Cocytus System itself. They are allowed access to the more restricted sections of the House Headquarters (areas normally reserved for Summit only). They can move their personal quarters to the Hall of the Paladins, a Paladin only complex with lavish rooms, sparring rooms and meditation chambers. The Hall of the Paladins also comes with its own staff of servants and slaves. Upon elevation to Officer of the Order of the Scholae Empire, they are allowed to construct their own personal castle in system. This castle can be used full-time or as a retreat for rest and relaxation. Paladins are also given rights to utilize any of the ships under the command of the House, save for the Star Destroyers. In times of war, Paladins can choose which vessel they use in combat, or serve upon. In times of peace, if they have a need of a ship, they are given priority clearance to the vessel of their choosing. Finally each Dark Paladin is given a finely crafted plaque created from materials mined on Judecca itself. The plaques grow more and more lavishly decorated the higher circles a Paladin rises to. They are given as a permanent reminder of the deeds and greatness that brought the Paladin to where they are now. The Paladins of Scholae Palatinae are an elite fraternity of the very best. Together they are expected answer the calls and duties of the House they serve, but in return they are given the very best of opportunities. In some cases, Dark Paladins have gone on to leave Scholae Palatinae for other units. In these cases, the title, and the rights that come with it, are suspended, but not permanently removed, as the Dark Paladins' mark on the clan will remain forever. This page was last modified on 18 January 2019, at 18:10.